VATICAN CITY (CNS) — Although prayers and meetings with Orthodox leaders dominate the schedule of Pope Francis’ Nov. 28-30 trip to Turkey, he also will meet government leaders and visit Istanbul’s Blue Mosque. The pope and the patriarch send delegations to each other’s churches each year for the celebrations of their patron saints’ feast days: the Vatican’s June 29 feast of SS. Peter and Paul and the Orthodox churches’ Nov. 30 feast of St. Andrew. While the pope will pray with and meet privately with Patriarch Bartholomew Nov. 29 and attend his celebration of the Nov. 30 feast day liturgy in Istanbul, Pope Francis also will visit the city’s Hagia Sophia Museum, an architectural masterpiece once regarded as the finest church of the Christian Byzantine Empire. It was later converted into a mosque in the 15th century and then turned into a museum in 1935 after Turkey became a secular state. Pope Francis will visit the grandiose Sultan Ahmet Mosque, or the Blue Mosque, as it is often called because of the turquoise ceramic tiles that adorn the 400-year-old structure’s interior. 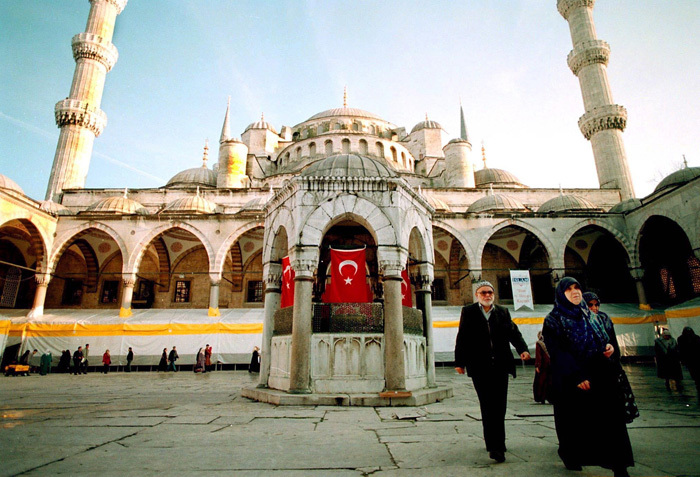 The scheduled stops underline Turkey’s varied cultural heritage and history as being at the crossroads of Christian Europe and the Muslim Middle East. The first day of his trip, which will be spent in Ankara, the capital, will be dedicated to relations with the Turkish government, its office overseeing religious affairs and ambassadors serving in the country. The head of the department of religious affairs is Turkey’s highest Muslim authority. The Vatican published the pope’s schedule Oct. 21, but without providing the exact time and features of many of the events because details remain to be finalized. Here is the schedule published by the Vatican. Times listed are local, with Eastern Standard Time in parentheses. — 9 a.m. (3 a.m.) Departure from Rome’s Leonardo da Vinci Airport for Ankara. — 1 p.m. (6 a.m.) Arrival at Esenboga International Airport in Ankara. — Visit to the mausoleum of Mustafa Kemal Ataturk, founder of the Republic of Turkey. — Welcoming ceremony and courtesy visit with President Recep Tayyip Erdogan. — Meeting with government authorities. Speech by pope. — Audience with Prime Minister Ahmet Davutoglu. — Meeting with the president of the government office for religious affairs. — 9:30 a.m. (2:30 a.m.) Departure from Esenboga International Airport for Istanbul. — 10:30 a.m. (3:30 a.m.) Arrival at Ataturk International Airport in Istanbul. — Mass with the papal delegation celebrated in private. — Divine liturgy in Church of St. George. Speech by pope. Signing of joint declaration. Lunch with Patriarch Bartholomew. — 4:45 p.m. (9:45 a.m.) Farewell ceremony at the Istanbul airport. — 5 p.m. (10 a.m.) Departure from Istanbul for Rome. — 6:40 p.m. (12:40 p.m.) Arrival at Rome’s Ciampino airport.